For outdoors lovers, the Garmin fenix 5 has been the go-to smart watch for those adventuring the world. But, the Garmin Instinct is going to change this! The Garmin Instinct allows for a similar smartwatch experience at an entry-level price. 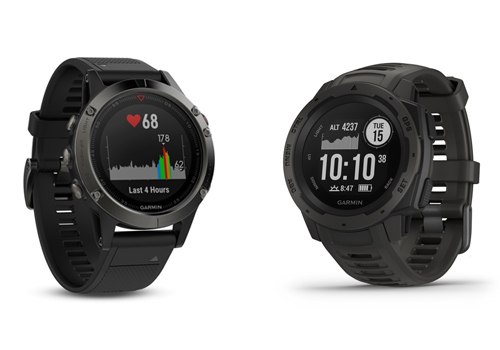 Starting from $399 the Garmin Instinct is significantly cheaper than the Garmin fenix 5, especially the fenix 5 Plus variants. Obviously, with the price difference there is going to be some features that won’t be available. We’ll get into that later. Due to its rugged and tough design, the Garmin Instinct is perfect for those working in harsh and demanding conditions. Carpenters, plumbers, electricians, builders and emergency workers will certainly approve of the thermal, shock and water resistant construction. As we’ve all seen over the last five years, watches and smart watches have become larger, not necessarily because of engineering though also aesthetics. Brands like Nixon, Casio and Suunto have been using bulky, bold and large designs to appeal to men. This is the segment Garmin is addressing with the Garmin Instinct. In contrast with the Garmin fenix 5, the Garmin Instinct is much bulkier in appearance, though physically the dimensions are roughly the same. Okay, so the screen on the Garmin Instinct is very different to modern smartwatches. In fact, the watch has two screens. The screen size according to Garmin is 0.9” or 2 mm. Further, the screen within the Garmin Instinct is monochrome, meaning it only displays in black and/or white. The fenix 5 has a bigger and better colour screen, and double the pixel count. Let’s be honest though, the screen doesn’t make or break the watch (no pun intended). In general Garmin displays are extremely durable and perform amazingly in tough conditions. Both watches don’t drain the battery and are sunlight readable. If you’re a super athlete wanting to check all the available metrics you can measure, the Garmin Instinct is probably not the watch for you. However if you’re a tradie or emergency services worker, the Garmin Instinct may be the watch you’ve long been waiting for. As with the price difference with the two watches, some features have not trickled through to its cheaper outdoor brother. The Garmin Instinct will start from $399 with expected high demand. If you would like to get your hands on one ASAP, please place an order now! The post Garmin Instinct Vs Garmin fenix 5 appeared first on Highly Tuned Athletes.